Eligible two-year-olds can have a free early learning place at our school, for up to 15 hours a week. Early learning is good for children’s social, physical and mental development and also helps them to prepare for school – giving your child the best start in life. Click here to apply online to see if you are eligible for FREE 15 funded hours. Once confirmed, bring in your confirmation to claim your place now for a January start. 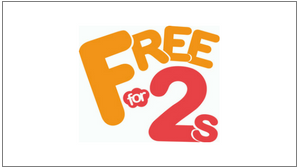 We also provide paid provision within our 2s. Call us on 020 8802 7520 for more information.